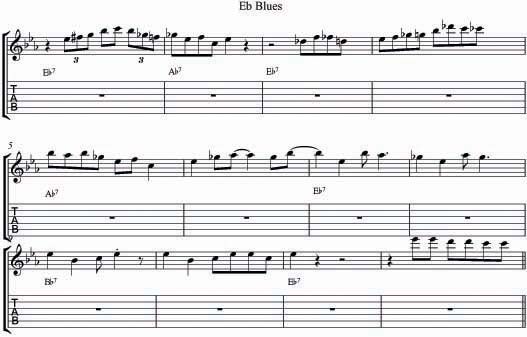 Unaccompanied Bb Blues used as the intro to her “Bebop and Swing Guitar” video from Hot Licks. An obvious homage to Wes Montgomery’s D Natural Blues. Emily swings! Bill is an artist that is difficult to categorise. Interesting to hear tunes from 60′s onwards getting solo guitar treatment. This is the second chorus of Keith Jarrett’s solo on the Eb blues tune Sandu as found on the album Whisper Not. Note: Targeting device on beats 3&4 of the third bar that sets up Eb on beat 1 of the 4th bar. Also the rhythmical phrasing in bars 9-11 is effective also. Simple pentatonic line but phrased so well.